If you know what you'd like to search for, select Search, then enter your search term(s). To run an advanced search, select Search, then Advanced. This lets you search by subject, audience, format, date added to site, awards, ISBN, and more. 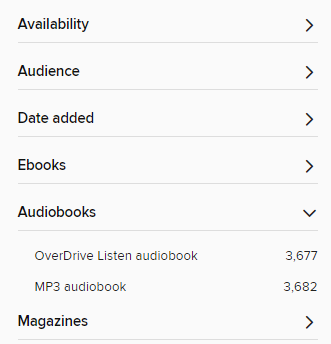 To browse through titles, use the Subjects menu near the top of the website to view all subjects in your library's digital collection. Or, use the Collections menu to see collections of newly added titles, popular titles, or librarian picks (collections vary by library). On a mobile device, tap in the top-right corner to see these options. Choose to see your results as a grid or a list. 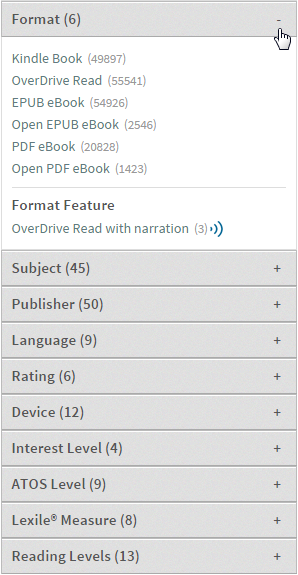 List view shows more information about each title, including a short description and whether it's part of a series. 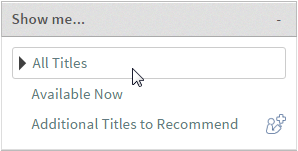 Use the "Availability" filter to view all titles that fit your search, only titles that are available to borrow now, only titles that haven't been released yet, or to add titles that you can recommend to your library. Sort your results by relevance, popularity, date added, release date, or alphabetically by author or title using the drop-down menu. Filter your results by audience, date added, format, and more using the expandable filters. Select multiple subject filters to find exactly what you're looking for. 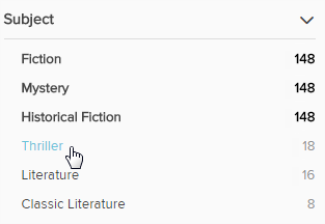 For example, you can select "Fiction," "Mystery," and "Historical Fiction" to see only the titles that meet all of those qualifications. The more filters you choose, the more specific the results will be. You can see current filters, remove a filter, or clear all filters at the top of the filter list. To perform a quick search, enter your search term(s) in the search bar. Or, to search by multiple criteria, click Advanced Search. This lets you search by ISBN, date added to the site, subject, format, awards, and more. Choose to see your results as a grid or a list. Search within your results using the "Search within results" bar. Use the "Show me..." filter to view all titles in your library's collection, only titles with copies available, or additional titles that you can purchase or recommend to your library (if your library offers these features). 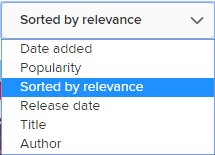 Sort your results by relevancy, title, author, and more using the "Sort By" drop-down menu. Filter your results by format, subject, publisher, and more using the expandable filters.